Crazy Teens, Dave Reynolds Crazy Date Silent Auction to Benefit Norton Records!! The Crazy Teens. 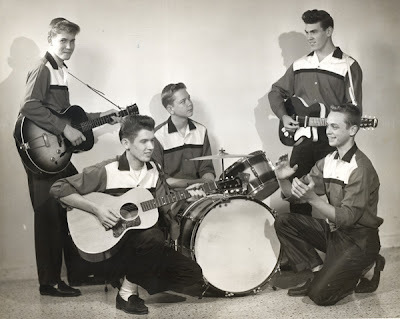 Left to Right: Dave Reynolds (standing with guitar); Ronnie Foster (kneeling with guitar); Billy Ward (at drums); James Farris (standing); and James Jones (clapping). In 1959, a group of Tuscaloosa, Alabama teenagers recorded a song called "Crazy Date". Though it was never more than a regional hit, a lot of people agree that the song deserves its place in rock and roll history. 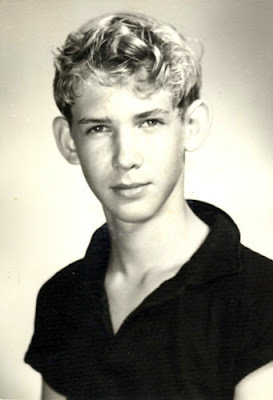 Inspired by Chuck Berry’s "No Money Down", Dave Reynolds had written the song at the age of 13, and then his sister, Jeanne came up with the lyrics while they were living in Miami, Florida. Besides Chuck Berry, Dave was especially influenced by Bo Diddley, Muddy Waters and Count Basie at the time, and he was musically inclined from an early age. Dave started out playing bass fiddle, and then the ukulele before turning to the guitar; at the time of "Crazy Date" he played a Gibson ES 125 guitar with a single pickup. After the family moved to Tuscaloosa, Dave started looking around for other musicians to play with and found guitarist, James Farris; guitarist, Ronnie Foster; and drummer, Billy Ward. Dave’s father, William Neville Reynolds, supported his son’s musical efforts not only by encouraging him to start a band and driving him to rehearsals and gigs but by paying for the recording and pressing of "Crazy Date". 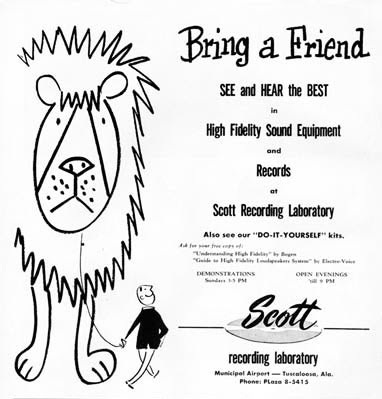 1956 Advertisement for Scott Recording Laboratory. Dave’s dad went to the phonebook and found the Scott Recording Laboratory, located at the Tuscaloosa airport (which Dave remembers as resembling a living room) where he booked the session. James Jones, who was not a regular member, joined them to play bass for the recording of "Crazy Date"(click to hear Crazy Date). When the A Side was taken care of they realized they needed a song for the other side. So Dave wrote the B Side instrumental “Rebel Boogie”(click to hear Rebel Boogie) on the spot at the recording session. Finally, they needed a name. Since they were recording "Crazy Date", and they were all teenagers, the guys decided that the band should be named "Crazy Teens", and the recording was sent to MGM for pressing. Lables from a record formerly owned by Jean Lake. Dave recalls that 500 45 rpm single records were made. The band members kept 200 and 300 were sold. They promoted "Crazy Date" at the WTBC radio station (which was on 15th Street across from Horne’s BBQ - now Mike and Ed’s BBQ). The 45 was sold at a 5 & 10 store in the Leland Shopping Center in east Tuscaloosa. It was instantly a local hit that sold 50 copies on the first day it was out, and Dave went on to be voted most popular boy in 9th grade. He still worked a job at a filling station, but was able to earn most of his money by playing music at talent shows, dances and skating rinks. Dave Reynolds, circa "Crazy Date". Over the years Dave has played in other rock and roll and jazz bands including Alabama Cavaliers, the Furys, the Starlighters (who he recorded an LP with), and the Spooks as well as gospel groups and the country band, Endless Highway. He was a member of Salt and Pepper, one of the first integrated bands in Alabama, who played shows at the University of Alabama, the Citizen’s Club, the 61 Club in Tuscaloosa and throughout the Southeast. "Crazy Date" has since been reissued on the "Sin Alley 1" LP compilation (1986) on the Crypt record label and on a Norton Records 45 single. As a result, the song got introduced to a new adoring audience and spawned cover versions by bands including Ray Condo and his Hardrock Gonners, The Hellhounds, The Senders, Speedball Baby, Ted & The Tall Tops, Thee Hamstrz and the Tri-Tones. Dave now plays the bass and is a mentor for young musicians at Shelton State Community College, and he still sees fellow "Crazy Teens" James Farris and Ronnie Foster from time to time. He no longer plays the guitar, or consequently, "Crazy Date" but he does keep an ear out for cover versions by other groups. And, 50 years later, they’re still coming. Though, nothin’ beats that original craaazy song recorded by five teenagers at the Tuscaloosa airport! A very special thank you to Dave Reynolds and his daughter, Susan Reynolds, who interviewed her father and provided copies of vintage photos. Special thanks to Billy Miller and Miriam Linna of Kicks magazine and Norton Records, Tim Warren for his article on Dave Reynolds in Kicks #6, George Hadjidakis and Lori Watts. Coolaceous Story, it would be cool if you could post an MP3 of these songs. Me dumb, you have links to the songs right there on the page! Introduced to the Crazy Teens via Oxford American's 12th-annual "Southern Music" issue. What a fun tune! Who knew it'd still be cool 55 years later!